This author Doug Merritt has created 5 entries. On Saturday, December 3rd, the Guardians of Justice took part in the 6th Annual Outreach autism Services Network (OaSN) Sensory Friendly Christmas Party in Ocala, FL. OASN is a nonprofit agency founded May 12, 2011 offering free autism services to the community. OASN (formerly Ocala Autism Support Network), was founded to facilitate the BEST outcomes™ for individuals with autism through education seminars, respite care, social skills classes, referrals, support meetings, events and more. Early in the morning on Saturday, September 24, 2016 Guardians of Justice members were given the opportunity to attend their very first event in coordination with local organization Drag Race for a Cure (DRC). The sun was blazing as everyone lined up to enter this awesome event! 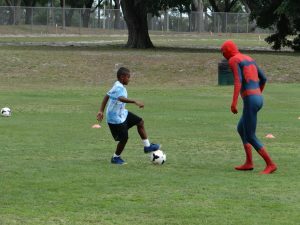 Horsepower was in great supply as Captain America, the Winter Soldier, Batman, Tinkerbell, Green Arrow and a Jedi Knight emerged to greet the gathering participants and spectators alike. 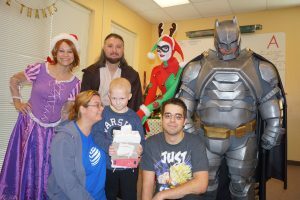 On Wednesday, June 22nd, The Guardians of Justice answered the call and paid a visit to the very brave young men and women staying at the Florida Hospital for Children’s Walt Disney Pavilion. Batman, Green Arrow, a Ghostbuster and Darth Vader were dispatched for this very important mission. Darth Vader, who is no stranger to medical treatments and familiar with the hospital equipment, agreed not to cause any trouble for the day and to do his best to be nice to everyone. Our Guardians of Justice Heroes were assisted by Florida Hospital Administrator Nussi Afroz as she escorted them through the three floors and various wards of the hospital where they met and interacted with the brave children under the Hospital’s care. 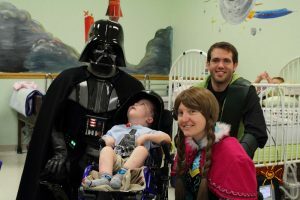 There was an awakening of the force as an unlikely alliance formed among characters from the dark side and the light as they visited the children at BrightStart Pediatrics Wednesday, May the 4th. Many of the children wore their Star Wars best –which showed the force was strong with these young ones! The visiting Guardians of Justice roamed room-to-room, meeting and playing with the children under BrightStart’s care. Darth Vader showed his young apprentices how to use the force –with a Jedi on hand to keep a close eye on things in case the force use turned too far to the dark side.